A motorised labyrinth with the motifs of your favourite hero Little Mole will bring great entertainment to your smallest. This wooden toy is great for motor development and logical thinking. When shifting beads from one side to the other, children also develop a sense of hand-eye-coordination. The labyrinth is made of quality wood; its merry colour rendering will delight and attract every child. 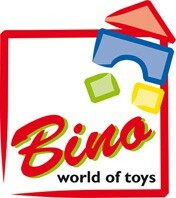 For shipping to other EU countries visit this page Bino Motorised 3D labyrinth - Mole. Für Versand nach Deutschland, besuchen Sie bitte Bino Der Kleine Maulwurf motorische Spiel-Labyrinth für die Motorik. Chcete doručit zboží do Česka? Prohlédněte si Bino Krteček - Motorický 3D labyrint. Chcete doručiť tovar na Slovensko? Prezrite si Bino Krtko - Motorický 3D labyrint. Für Versand nach Österreich, besuchen Sie bitte Bino Der Kleine Maulwurf motorische Spiel-Labyrinth für die Motorik. Magyarországra történő kiszállításért tekintse meg ezt a termékoldalt: Bino Kisvakond - 3D labirintus.